Mattress protectors and toppers are becoming increasingly popular recently, but you might be asking yourself what the differences and advantages between them actually are. There are also many different types of protector and topper available. Let’s explore these differences. Protectors are used to protect a mattress and or provide a limited softening effect, and are also often placed over a topper to secure it to the mattress. Toppers, by contrast, are used almost exclusively to improve mattress comfort. However, it is common for many products to be labelled as both topper/protector. Mattresses, particularly innerspring mattresses, tend to become compacted and lose much of their cushioning with age. A range of mattress topper types are available to improve to mattress cushioning, which results in better comfort and reduced pressure points, meaning meaning a mattress topper can provide some of the benefits of a new mattress for just a fraction of the cost. A topper can alter the feel, firmness and comfort of a bed to better suit the personal requirements of the sleeper. Some toppers can not only improve the comfort of a mattress but can also strengthen the support it offers to the user, albeit to a limited degree. This results in reduced pressure points, which can help ease aches and pains while sleeping. Memory foam is the most popular topper/protector type mainly due to the general effectiveness they offer in the fields of improving comfort at a relatively low cost. However, memory foam can result in the “out-gassing” of an odour from the foam when a topper or protector is first purchased. 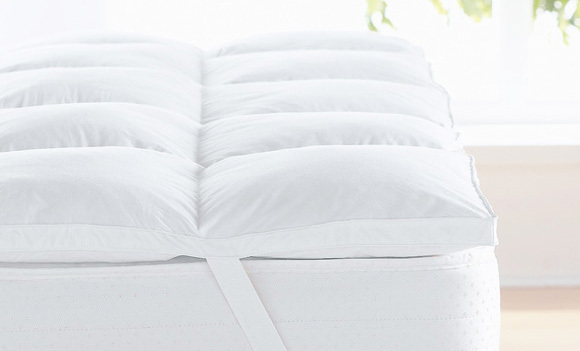 Pure cotton mattress toppers and protectors are thin, quilted and easily washable. They are often designed to extend the life of a mattress by protecting it from the damage caused by bodily fluids. They have an elastic edging that neatly fits around the side of a mattress, and have the benefit of being hypoallergenic due to the natural properties of cotton. Tencel is new kind of fibre that’s quickly increasing in popularity. A man-made fibre made from trees, Tencel is not only friendly to the environment, it’s also more absorbent than cotton and extremely breathable. This means these mattresses a user lives in they will experience a comfortable sleep throughout the year no matter what climate they live in, and help create a relaxing atmosphere that can potentially reduce issues of insomnia. Down or feather toppers and protectors are resilient, although they have a habit of clumping up and therefore need shaking regularly as a result. These are certainly luxurious options, however, they are not suitable for those with feather allergies. This man-made fibre is an excellent alternative to feather or down toppers. Siliconised ball fibre gathers in soft clusters to mimic the cosy feeling of natural fibres. They are an excellent alternative for allergy sufferers who want to experience the luxury of a feather or down topper without suffering a reaction. Mattress toppers are generally effective at increasing comfort, support and the longevity of a mattress at a relatively low cost. The various topper types mentioned here each have their own distinct advantages and disadvantages, so be sure to consider which kind sort of topper would best suit your needs before you buy. Categories: Bedrooms, Home & Garden, Shopping.